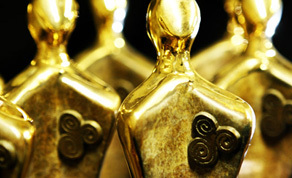 The Irish Film and Television Academy (IFTA) has annnounced the shortlist of nominees in 40 strongly contested categories for the 9th Annual Irish Film and Television Awards, which takes place on Saturday 11th February 2012 at the Convention Centre Dublin (CCD). Nominations have been announced in categories across film and television, celebrating the highest standard of Irish talent over the past twelve months. All IFTA’s categories have been shortlisted by Members of the Irish Film & Television Academy’s fourteen chapters alongside a select Jury panel of industry experts from around the world. The features nominated for Best Film at IFTA 2012 are; the period drama Albert Nobbs; Irish psychological thriller Charlie Casanova; black comedy The Guard, and rural drama Stella Days. Screenwriters for all four of the Best Film contenders - John Banville & Glenn Close, John Michael McDonagh, Terry McMahon and Antoine O’Flaherta - have been nominated for Script Film whilst McDonagh and McMahon join fellow debut director Rebecca Daly (The Other Side of Sleep) and IFTA winner Thaddeus O’Sullivan (Stella Days) in the category for Director Film. In the feature film acting categories, Tinker Tailor Soldier Spy star Ciaran Hindsreceives an IFTA nomination alongside The Guard actor Brendan Gleeson. Michael Fassbender has been nominated for his performance in Steve McQueen’s drama Shame and Martin Sheen, an Irish citizen, has also been nominated for his role as Irish priest Fr. Daniel Barry in the Irish production Stella Days. Sheen's Stella Days co-star Marcella Plunkett has also been nominated with Antonia Campbell Hughes (The Other Side of Sleep) shortlisted for the first time in the Lead Actress category following her Rising Star nomination in 2011. Newcomer Aoife Duffin is also nominated for her performance in Behold the Lamb. IFTA winning actress Saoirse Ronan has been IFTA nominated for her lead turn in Hanna. Albert Nobbs star Glenn Close and The Guard actor Don Cheadle have both been shortlisted in the International categories for their performances in these Irish features. The Irish Film & Television Awards are sponsored by Irish Film Board/Bord Scannán na hÉireann; RTÉ, IFTN, Broadcasting Authority of Ireland, Philips, RTÉ Guide; and has Partners MAC, CityJet, BMW, Moet & Chandon, Walt Disney Studios (Ireland).